The problem with rivers is that they can be a lot of work (ie time) to do well. They also need a fair bit of skill and the finished terrain is likely to take up a lot of storage. The river I have in mind for next year's game may run to 12 feet! That's a lot of river to both make and store!! Time to step back and consider the options. I have a small river (stream really), together with ford and a couple of bridges that I bought last year from Magnetic Bases at Salute. These resin pieces were painted earlier this year for our games of SAGA and whilst they are ok, the sections are a bit short and rather 'jointed' in appearance (currently packed away so no photos). I have therefore decided I want to create a river that will be less segmented (ie longer sections) and can be used at different widths for different games and scenarios. 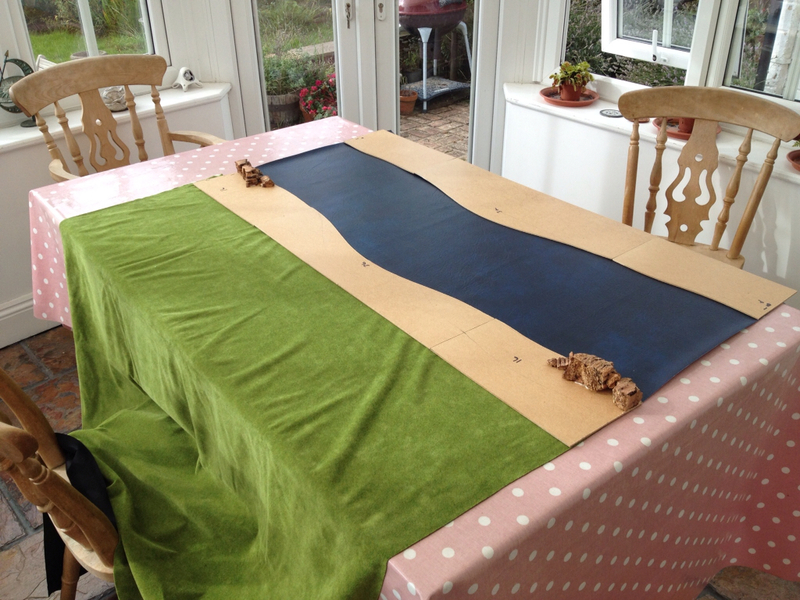 Crucially, the river has to be relatively straightforward to construct, but still look good for our games. My solution is still evolving, but currently takes the form of a vinyl mat cut into two four foot lengths (if it works out I'll get some more for next years game). I am now creating wooden shorelines, each section of which will be one to two feet in length. The idea being that the shorelines are placed on top of the vinyl and can be moved closer or further apart as required. Anyway, here's what I have done so far for SELWG. The next step is to cut some polystyrene into appropriate shapes and glue them in place. After a liberal coating of filler, rocks and sand will then be added before the shoreline sections are primed, painted and flocked. I'm also aiming to make a removable shingle bank and a couple of mid-stream islands. It should be possible to construct the islands in such a way that they have some white water to give the river the illusion of flowing water. We'll see. I suspect some trial and error will be called for. I've also just finished three points of Vikings. Three more to go. SELWG is in four weeks so plenty of time - I hope! Watching this with interest...seems like the perfect excuse to get the Adrian's Walls Longship! I have exactly the same problem: I need a river, estuary or coastline for my own Viking ship. This sounds like an interesting approach and I'll be watching keenly to see how it turns out.